If your air conditioning system doesn’t seem to be working as well as it used to, knowing how to check if your AC unit needs more Freon could help make your room comfortably cool. During the summer months, when the weather heats up, lots of homeowners start to question whether they have low Freon levels in their air conditioner and whether they should refill or recharge their refrigerant. 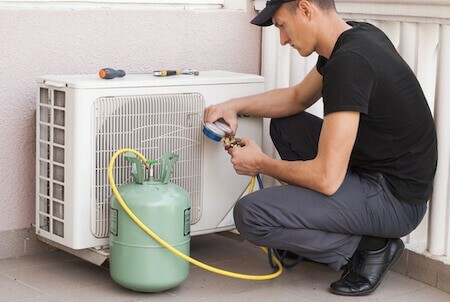 If you’ve discovered that your home cooling system isn’t producing as much cold air as it used to, it could be a key sign that your AC freon needs refilling – after all, no matter which model of air conditioner you have it won’t run for life without any faults! Here, we tell you how to check the refrigerant level of an AC unit so you can arrange a recharge. Recommended Reading: Don’t miss our guide to quiet AC units. Does my Air Conditioning Unit Need a Freon Recharge? There are a number of things which could be wrong with your air conditioning unit. That means you need to make sure before you start arranging a recharge that the level of Freon for the AC unit is low. When your condition requires a recharge, it will start to blow warm air rather than cold air. Just put your hand next to the vent which releases the cool air into the room to check the temperature. This will give you a good idea whether the air that is being blown into your space is actually being cooled or whether it’s warm. Another way to check Freon levels is to check the thermostat reading. This will detect a charging problem. If the thermostat appears to be malfunctioning or broken, you should try resetting it, then turning on your conditioner so you can check for temperature changes. A broken thermostat may not be an indicator that your system requires a recharge, so call a professional to ensure the problem is properly diagnosed. Recommended Article: We’ve got casement air conditioners covered in this article. While some air conditioner maintenance tasks are suitable for you to tackle yourself at home, others need a professional to do the job. You need to know which tasks you can safely take on yourself in order to save time, effort and money and also prevent any damage being caused to your system. Fan – checking the fan is something you can do yourself, as well as checking the temperature of the air being blown through the vents and checking whether the thermostat is functioning properly. You should switch on the air conditioning unit, then visually inspect the fan. It should start moving automatically. If it doesn’t move, there’s a chance the motor could be at fault. Never put your hand inside the fan as this could be dangerous. Any problem with the fan’s motor should be dealt with by a professional. Filter – the air filters can easily clog up with debris and dirt. If you’re comfortable with checking your filters in a safe way, ensure they are unblocked and clean. Often, cleaning your air filters thoroughly will get your cooling system running properly again. Frost – if the coolant is leaking, this could cause a malfunction in your air conditioning unit. Luckily, it is easy to detect a leak since frost will start to accumulate on the motor, tubes and other system parts. If you notice frost building up on your unit, contact a professional to get the problem sorted out. Coolants can cause you harm if they’re handled wrongly, so always get a professional to deal with the leak. Hissing – another sign that your Freon level may be low will be a hissing sound from your unit. AC refrigerant won’t run out for no reason, so there must be a leak somewhere. A large leak will result in a bubbling or hissing sound as the refrigerant escapes. The noise could be coming from any part of the refrigerant line, so try listening at various points along the line to detect sounds. Soap Test – soap solution represents the cheapest and oldest way to detect any leak in your air conditioning system. Put a solution of water and soap onto any area where you suspect there may be a leak. If any coolant is escaping you should see bubbles. This is an effective method if there is a continuous leak, however, if the leak is very small this method won’t work well. Electronic Detectors – Sometimes known as a sniffer, an electronic detector will emit a noise or show a visual indicator if a leak is found. There are several models of electronic detector available to buy, however, the results may not be very reliable, especially if the weather is windy. We have an awesome guide to assist you in purchasing a leak detector if you feel you need one. If you have carried out all the maintenance tasks and cleaned your unit and it still isn’t working effectively, the chances are that the Freon requires recharging. Can I Recharge my own Freon? 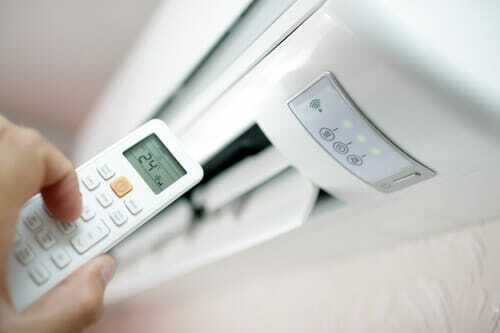 If you discover that the Freon level in your air conditioner unit is low, you should arrange for it to be recharged. Having low refrigerant levels won’t just make your home an uncomfortable place to live, it could even damage the air conditioning unit severely. If the refrigerant flows back to the outdoor unit, the compressor could be irreparably damaged. As it is expensive to replace the compressor, you will usually end up having to buy a new unit and this is costly. It makes sense to get your Freon level topped up. Recommended Reading: Don’t miss our guide to the smallest AC units! It might sound like a simple task to recharge your air conditioning unit’s Freon, and you may think that it’s a good way of saving money. However, recharging Freon is actually very dangerous so you should never do this yourself. Homeowners don’t have the necessary professional knowledge to carry out a Freon recharge. Therefore, calling in a professional is vital. 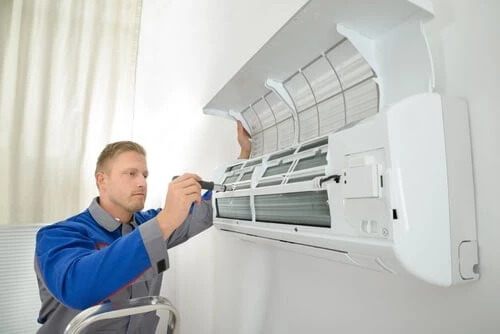 A professional will be able to properly charge your air conditioning system as well as carry out maintenance checks to ensure your system is functioning to its optimal level. By checking the entire system, it’s possible to diagnose any problems and solve the problem quickly. Calling in a professional will also help you to avoid making an expensive mistake while also prolonging your air conditioner’s lifespan.